TechBite: How's Your Hard Drive Doing? Hard Drive Inspector is a handy tool to monitor your drives for spin rate, seek time, and almost 20 other potential problem spots. The program also supplies specs–including drive model, firmware version, and serial number, all perfect when calling for warranty support. The drive’s temperature is displayed in the system tray; if the drive gets too toasty (I have mine set for 120 degrees Fahrenheit), you can get an e-mail alert, or better, automatically put the computer in Standby mode. You can view a summary health report that’s enough for most of us; the S.M.A.R.T. report has the details. Hard Drive Inspector costs $30, but you can download a 15-day trial version to give you a feel for the tool; the trial is fully functional, though limited to one drive. Nonetheless, it’ll tell you everything you’ll need to know about your drive. Note: At press time (an antiquated phrase if I ever heard one), the Hard Drive Inspector’s site is temporarily down. You can read about the product by looking at a Google cache. It’s not as comprehensive as Hard Drive Inspector, but if you’d prefer a freebie (of course you would! ), download CrystalDiskInfo. 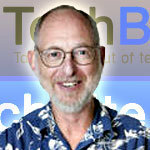 TechBite columnist steve, Drive, google cache, Home, inevitable crash, Inspector, Newsletter, steve bass, TechBite, warranty support. permalink. I have a Dell XPS 720. It has an nVidia 280 GTX graphics card and 8 GB of RAM. My computer enters Power Save Mode spontaneously – 11 times yesterday! – and it’s driving me nuts! Dell does not seem to know what the problem is although it was suggested that there might be a conflict between the GPU and RAM(?). PCPitstop’s overdrive test is also a pretty good indicator of pending drive failure. It will provide s report about the disk IO measured in MB/sec. A healthy drive should be running at about 20 MB/sec or higher. Anything as low as 15 or less is a good sign of a drive that may either soon fail, or that is running so slow that it is likely impacting system performance, and perhaps even causing errors. The overdrive test is a good place to start when troubleshooting system problems, or just for setting a baseline on which you can later gauge the health of the system. I can see no mention of the word RAID. Does it handle multiple drives?